Kelcey Baker has been working in the field of U.S. immigration law since 2012. Before she started law school, she was an immigration paralegal at Garfinkel Immigration Law Firm. 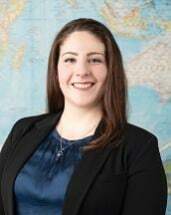 Prior to becoming an attorney, she was a summer associate and law clerk for Garfinkel Immigration Law Firm for two summers. During law school, she worked on asylum and VAWA cases in the Immigration Law Clinic, and co-authored a handbook on using expert witnesses in asylum cases. She also interned with the American Immigration Lawyers Association (AILA), writing legal briefs for asylum cases in the Fourth Circuit Court of Appeals. Ms. Baker represents employers and employees in a variety of industries including, but not limited to, healthcare, engineering, information technology, manufacturing, and academia. She has experience in the preparation of complex nonimmigrant and immigrant visa petitions, including specialty occupation, extraordinary ability, outstanding researchers, investors, and multinational executive and manager petitions. Ms. Baker also has experience working with employers to navigate the increasingly complex regulations and policies in immigration law. Ms. Baker enjoys cooking, films, and concerts - her favorite forms of cultural exchange.